You may book this Italy tour as a private tour for your group, large or small. Travel Anytime. Inquire. Group Size: 8 to 12 people – Also available for private groups, any size, any travel dates. Tour Overview: Join one of our upscale Italy small group tours to Tuscany that will also take you to the beautiful countryside of Umbria. This Italy tour, a small group tour, will take you to the Cinque Terre in Liguria. Enjoy the breathtaking scenery as we travel the peaceful Tuscan & Umbrian countryside in search of world-class art, living history and fine cuisine. We’ll visit such famous sites as Assisi, Siena, Orvieto, Pisa and Florence while also getting off the beaten track to explore small vineyards and hilltop villages. The accommodations in this upscale escorted Italy tour and their location were carefully selected to give our clients a variety of experience (country inn; 4 Star hotels) while providing elegant and comfortable accommodations. We have homebases in cities that offer you the most, including an overnight in Florence, a perfect city to end a fantastic trip to Italy. 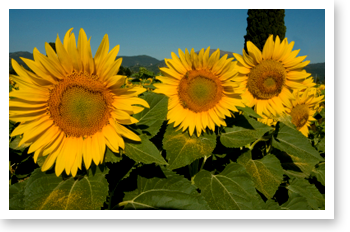 We are very proud of our “best” Tuscany and Umbria escorted small group tour. Join us. 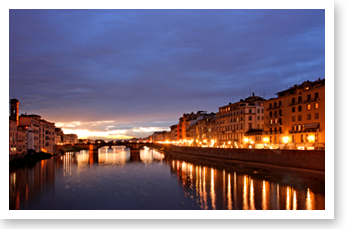 Arrival Airport: Florence – Arrive by noon to meet up with the private transfer to Lucca. Speak with us before purchasing your airline tickets. 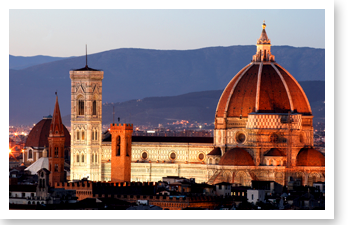 NOTE: You may extend your Italy vacation by arriving early in Florence or Lucca, or if you are interested in doing one of our pre- and post-tour extensions. We can help you make all the travel arrangements. Possible This Tuscany and Umbria tour has tour extensions to Venice and Rome. Airport Transfer on departure day. Itinerary for the Optional Venice Tour is found at the end of the itinerary below. We will meet you at the airport and our private transfer will take our small group to our hotel in Lucca, the charming, elegant city where we will spend the first three nights of our tour. This ancient Tuscan city is completely enclosed by a well preserved wall, wide enough to hold small parks and a path along the top. The birthplace of composer Giacomo Puccini, Lucca features charming squares, beautiful churches and great shopping. Today our small group will tour Cinque Terre in Tuscany and tour its clifftop villages towering above the sea. We will travel by train to Riomaggiore or take a boat to reach villages not accessible by car. Walking the path called the Via dell’Amore between the cliff-side villages of Riomaggiore and Manarola, you will be rewarded by fantastic views of the ocean, olive groves, fig trees and vineyards. We will also go to the town of Monterosso, whose verdant hills are dotted with olive groves and grapevines. Monterosso is more than just a pretty seaside view: we will have fun exploring this lively town. Today you will spend the morning in Lucca. You may be able to ride a bike on top of the city wall that surrounds Lucca. Your guide will lead you on this adventure if you are interested. The shops are open in the morning and all close at lunch time. Departure Time from hotel lobby: 2:30pm. Today, Pisa to pay homage to the enormous Miracle Square and its magnificent buildings, church, and baptistery – not to mention the famous Leaning Tower. Today we continue our tour of Tuscany. 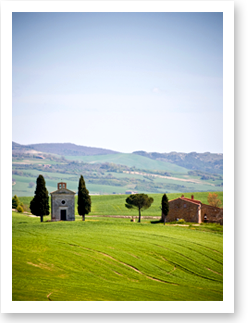 Our small group tour will take us to our next hotel in Pienza, a UNESCO World Heritage site and situated in one of the most scenic areas of in all of Tuscany. Pienza is the birthplace of Pope Pius II, who ordered the town to be redesigned into a masterpiece Renaissance city. Charming Pienza has many specialty stores, including food markets where you can sample pecorino cheese, one of the locally produced delicacies. En route to Pienza, we will make a stop in Florence for a guided walking tour of city known as the cradle of the Renaissance. We will visit such famous sites as the Accademia, home to Michelangelo’s Statue of David, and the Piazza Della Signoria, Ponte Vecchio, among others. You will have free time to explore the city and shop for the fine-crafted leather and gold products sold here. Let us know if you are interested in touring Uffizi museum in the afternoon, and we can arrange a visit to this must-see in Florence. This morning we’ll continue our escorted tour of Tuscany. We will travel through scenic countryside to reach Montalcino, whose acclaimed vineyards produce the world-famous beloved Brunello di Montalcino. Our group will tour a winery renowned for this fabulous red wine and sample some of the fruits of the vine, followed by a group lunch. You will have free time to enjoy this town complete with a fortress and buy some wine to savor later. In the afternoon, our group will continue touring Tuscany’s backroads to reach the Romanesque Abbey of Sant’Antimo, an unforgettable 9th-century Benedictine monastery. It is a simple yet magnificent stone church, set amongst the field of olive trees. We plan to arrive in time to hear the monks, clad in their white robes, chant their prayers in Latin at the altar. In the morning, we will head to San Gimignano, one of Italy’s most well-preserved medieval towns, known for its beautiful towers and a white wine called Vernaccia. You will have free time to stroll the medieval streets, shop for some unique souvenirs, and photograph the picturesque valley the town overlooks. From here, our group will travel to historic city of Siena. We’ll take you for a stroll, equip you with a map, list of sites to visit, and restaurant recommendations before sending you off to explore the town on your own. 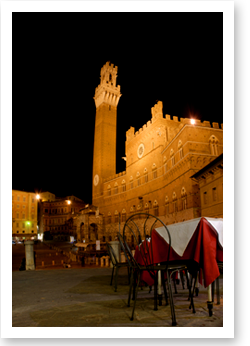 Siena, a UNESCO World Heritage site, has one of the most beautiful squares in Italy. The fan-shaped Piazza del Campo has a 14th-century tower and a beautiful cathedral featuring the work of such famous artists as Donatello. Today, we will move to Umbria, to our next hotel in Spoleto, our home away from home for the next three nights. On the way, we will stop in Montepulciano, known for its namesake wine, Vino Nobile di Montepulciano. The hilltop town features such sites as a fortress, Renaissance buildings, the beautiful church of Madonna di San Biagio, and a cathedral. We’ll sleep in today and start the morning with a guided tour of ancient Spoleto, a beautiful Roman town built atop a mountain on the Flaminia Road. Spoleto boasts many important Roman structures including its stone wall, theater and bridge, the town is also known for its 14th century fortress. This morning, our small group tour of Italy will take us to magical Assisi, the hometown of St. Francis, patron saint of the animals. Our guided tour of this spectacular city, built up the steep slopes of Mount Subasio, includes the tomb and Basilica of St. Francis, famous for Giotto’s brilliant frescoes depicting the saint’s life. We will also travel through time through Assisi’s various historical sites, from the Temple of Minerva and Piazza del Comune, both built two millennia ago, to a thirteenth-century church called Chiesa di Santa Chiara. Free time and lunch on your own after the tour. Today, we will move to our next and last hotel, in Florence. On the way, we will stop in Orvieto, an ancient Umbrian hill town dramatically situated atop volcanic tufa rock. Our guided tour of this charming medieval town features a beautiful Gothic cathedral and chapel where pilgrims and art lovers alike come to see Luca Signorelli’s colorful frescoes vividly depicting the Apocalypse. Orvieto is just as interesting below ground as it is above, with Etruscan and medieval caves, and the underground remains of an old olive press, for example. Orvieto is also famous for its museums, ceramics, and wines (most notably the Orvieto Classico.) Enjoy exploring this beautiful town on your own after the tour. Prepare for your departure for home. We will have a transfer take you to the airport in Florence. A short walk from your hotel are some of Rome’s most beautful squares: Piazza Navona, Pantheon and Campo dei Fiori. Have lunch in Campo dei Fiori, either at a take-out place called Forno for slices of pizza and such or at a restaurant called La Carbonara for a great selection of pastas. The end of your guided tour will leave you in the Pantheon square, where you may sit at one of the cafes facing what some of us believe is the most beautiful ancient structure in Rome. Our tour guide in Rome will pick you up at the hotel early in the morning for your guided tour of the Vatican museum, Sistine Chapel and St. Peter’s Basilica. At the end of the Vatican tour your guide will take you to Trevi fountain for a photo op and continue onto your final destination, The Spanish Steps, where our guide will leave you. Consider lunch at Ristorant Alla Rampa, on Piazza MIgnarelli, around the corner from the Spanish Steps. Taxi stand is by the obelisk should you decide not to walk back to your hotel. You are free to explore Venice on your own. Explolre without any specific destination in Venice can be very rewarding. You’ll experience many different neighborhoods, see how people live and come across great restaurants outside the tourist track. We suggest a quick visit to Peggy Guggenheim museum. The museum is in a mansion, her old home on the Grand Canal. It is located in a nice and quieter part of Venice. “Ning, we really enjoyed our second trip with your company. The trip is well planned, from delicious meals to nice, well-run hotels with attentive service. Our group was delightful. Everyone was glad to take a suggestion and go with it. We thoroughly enjoyed each other’s company and even scheduled dinners together when they were not planned. Raffaele, our guide, did a wonderful job at shepherding us through cities, towns, villages and countryside. Raffaele is quite knowledgeable and truly enjoys talking to people. He has a great sense of humor and shared his relationship with his family, which gave us a insight into the Italian family life. He also kept us moving and so we never were bored.